An international team of researchers has come up with a recipe for a microscale flexible energy storage device made of graphene and carbon nanotubes, which can store enough energy to rival the gold standard, lithium batteries. That’s significant because the device is actually not a battery, it is a supercapacitor that can charge and discharge much faster than a battery. It’s also significant because the research team has devised a fabrication method that results in a long fiber (long as in 50 meters long, so far). That opens up all sorts of opportunities for weaving the new supercapacitor into clothing to power portable electronics. Since the fiber also doubles as a conductor, it can also be used in place of wires to reduce the size and weight of portable devices, including medical implant. Previous study of graphene/CNT supercapacitor (published 2009) courtesy of Case Western. Batteries and supercapacitors both store energy, but there’s a catch. Batteries have a higher energy density which means they can store energy for longer periods, but they have low power density. That means they can’t discharge quickly. Supercapacitors have the opposite problem: their low energy density means they can’t store as much energy, but their high power density enables them to deliver energy rapidly when needed. The trick to solving the energy density problem for supercapacitors is to find a material with a relatively high proportion of surface area available for energy storage. That’s where graphene, the “nanomaterial of the new millennium” comes in. A new material discovered just 10 years ago, graphene consists of a sheet of carbon just one atom thick. The two-dimensional structure is basically all surface area, but the notoriously finicky graphene presents a whole raft of challenges for translating its powers into energy storage, photovoltaics, and other fields. 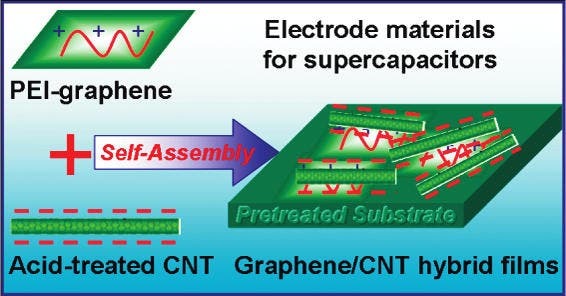 The schematic above is from a 2009 work on graphene/carbon nanotube hybrid supercapacitors by Dingshang Yu of Nanyang Technological University in Singapore and Case Western’s and Laming Dai, who are also members of the current international research team (China is also participating, through Tsinghua University). …most of the above-mentioned techniques [for obtaining graphene film] suffer from a lack of the film architecture/property control, leading to the loss of the surface area for energy storage due to graphene aggregation. For energy storage applications, therefore, it is highly desirable to use one-dimensional (1D) carbon nanotubes (CNTs) to physically separate 2D GNs to preserve graphene’s high surface area. The 2009 study arrived at a self-assembly process to solve the problem, resulting in a graphene/carbon nanotube film. The advantage of this structure is the enormous amount of available surface area for both energy storage and charge conduction, clocking in at a whopping 396 square meters per gram of fiber. The favorable comparison to lithium was demonstrated in a solid state micro-supercapacitor, which the research team assembled from two graphene/carbon nanotube fibers. With a polyvinyl alcohol/phosphoric acid gel as an electrolyte, the device achieved a density of 6.3 microwatt hours per cubic millimeter. According to the research team, that compares to a 4 volt/500 microampere-hour thin film lithium battery. They also found something interesting about how the fibers are arranged. When three pairs of fibers were arranged in a series, the voltage tripled and the time for charge/discharge stayed the same. However, when three pairs are arranged in parallel, both the output current and the charge/discharge time tripled. There could also be some significant advantages when it comes to cost and supply chain issues. Compared to lithium, carbon nanotubes and graphene are cheaper and more readily available. Also lending an assist with favorable cost comparisons, the hybrid supercapacitor appears to have a much longer lifecycle than conventional rechargeable batteries. The team tested their supercapacitor at 10,000 charge/discharge cycles and came up with a performance retention of about 93 percent. Conventional rechargeables generally lose performance before they hit the 1,000-cycle mark. To cap it off, the fibers also retained performance when subjected to flexibility and stress tests. Stay tuned, because the research team is also thinking ahead to applying their new supercapacitors to batteries, solar cells, and microbial fuel cells.